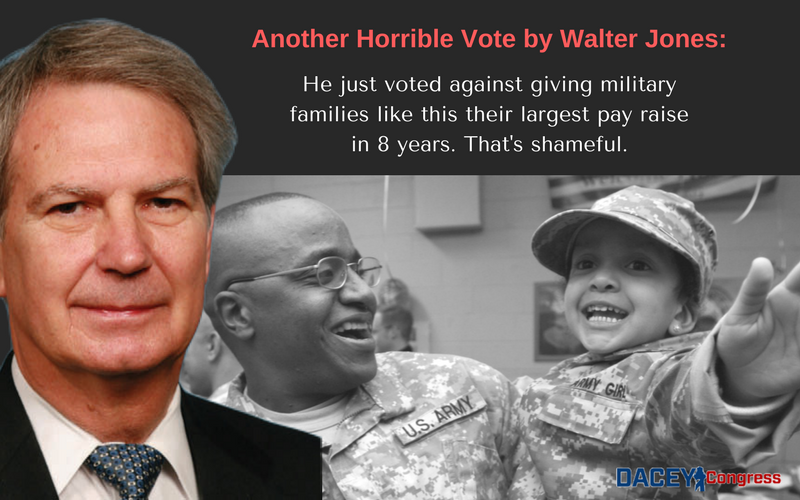 Below find a summary of Walter Jones' votes against the hard working families who make eastern North Carolina home. He can not be allowed to continue serving as a roadblock to President Trump’s Agenda. It's time for a change. The House of Representatives ​pushed forward another part of the Trump Agenda​​ by passing tax reform​. Unfortunately, our representative again chose to side with Nancy Pelosi and against the working families of eastern North Carolina when he cast his vote against H.R.1. This ​bill enables hard working​ families​ to keep what they have earned​​ ​and help​s​ businesses create new jobs. 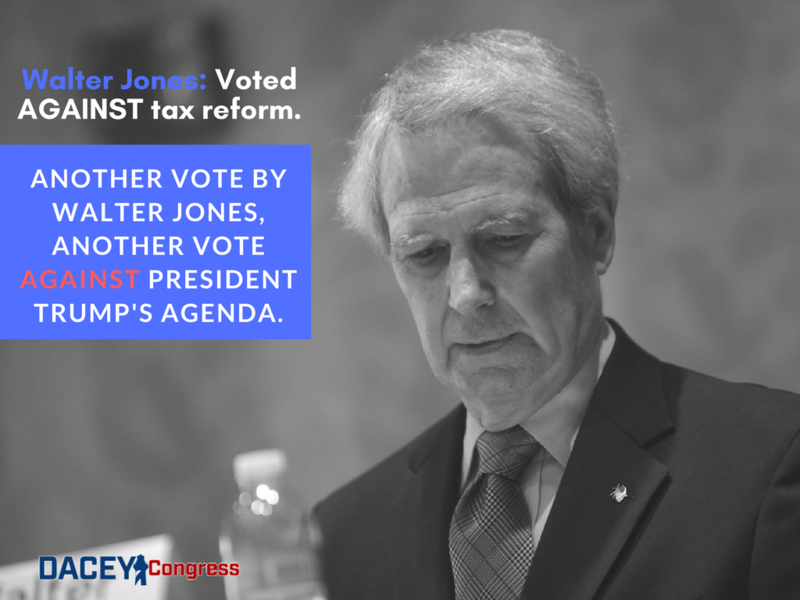 Walter Jones' vote against tax reform once again proves that he is out of touch with the needs of Eastern North Carolina, and proves that he will do anything he can to stop President Trump's conservative agenda.​ ​As your Congressman, I would have voted for this bill. Walter Jones was one of three votes in the entire House of Representatives to vote against H.R. 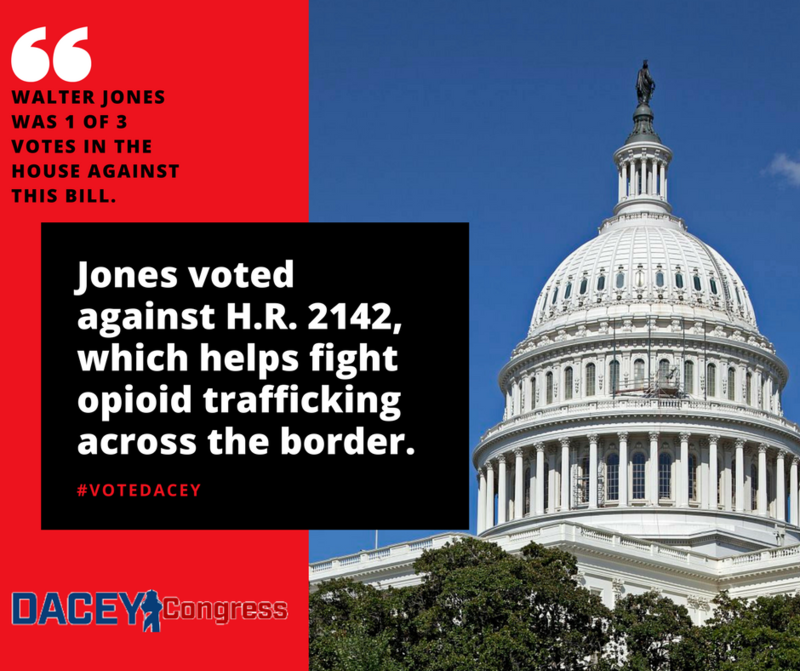 2142 - a bill that increases the number of opioid detection devices and opioid detection personnel available for U.S. Customs and Border Patrol to use, as they monitor the flow of goods coming from over the border. I would have voted for this bill. Furthermore, I am very proactive on this issue in my role as a Craven County Commissioner. 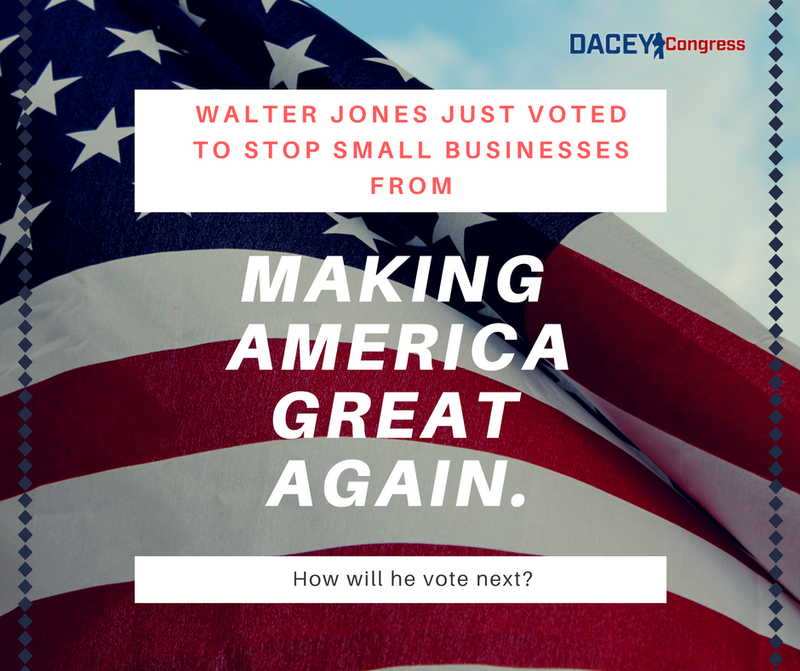 It's time we stop Walter Jones before he makes more irresponsible votes like this. Walter Jones voted against the defense bill authorizing spending for the fiscal year already underway. The NDAA, which provides our troops the largest pay raise in eight years and creates over $209 million in new funding for military construction projects at Marine Corps Air Station Cherry Point and Camp Lejeune, is critical to improving America's national security. The NDAA also provides our troops additional funding to improve their weapons and improves America's nuclear missile defenses against North Korea. And yet, Walter Jones still voted against this bill. He does not represent what eastern North Carolina needs and deserves. Repeal? Repeal and Replace? Neither? 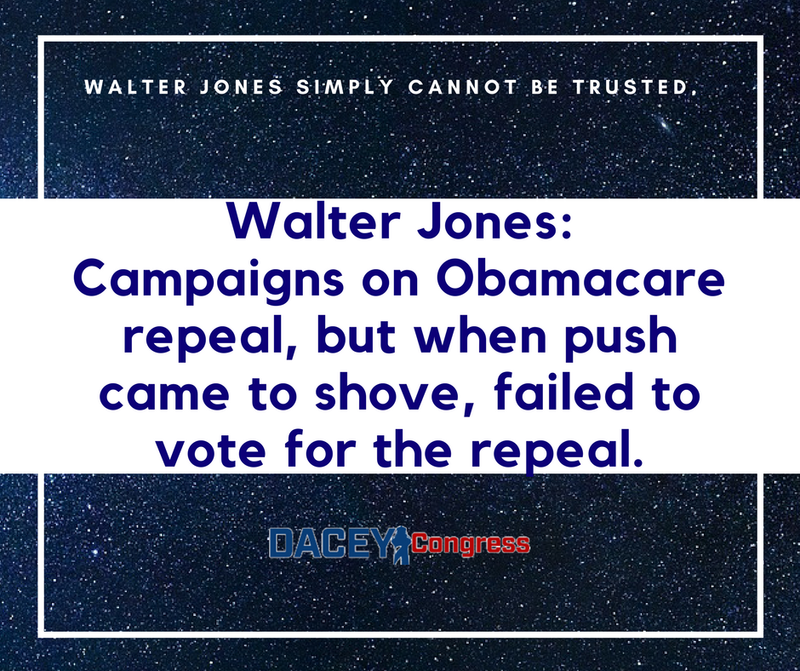 From 2011 to 2016 Walter Jones voted in favor of repealing all or portions of Obamacare at least five times. In 2017, once the Republicans captured both houses of Congress and the White House, he changed his tune, saying he would now only support a repeal and replace bill. On May 4th, he was given just that chance and chose Nancy Pelosi over the people of eastern North Carolina and President Trump, voting against the repeal and replace bill he asked for. Walter Jones' double talk on Obamacare underscores what's wrong with some Republicans in Congress. It's time for real NC Republicans to send Walter Jones home. 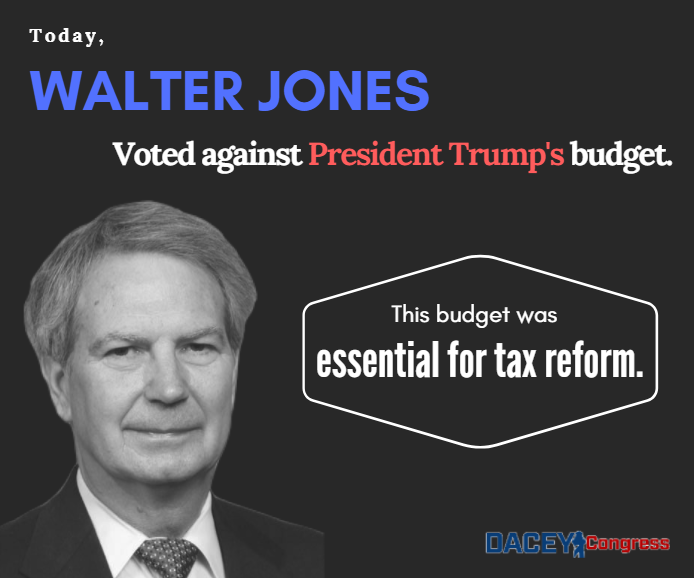 Trump obstructionist Walter Jones voted against President Trump's budget - a budget bill critical for the passage of tax reform. I'm tired of Walter Jones voting against our President at every opportunity. It's as if Jones does not want President Trump to succeed. I would have voted for this bill. The House overwhelming passed HR 2864, the Improving Access to Capital Act. This bill will allow small businesses a pathway to secure access to capital without being subjected to duplicative SEC filing requirements. In July, this bill was voted upon favorably by the House Financial Services Committee on a 59-0 vote, receiving praise from both Democrats and Republicans. Unfortunately, Walter Jones was one of three House members to vote today against this perfectly reasonable bill - A bill that will only help to Make America Great Again. Eastern North Carolina, we deserve a congressman who will support his colleagues when common sense solutions are found, not oppose them. Do you agree that Walter Jones' votes are out of touch with the needs of Eastern North Carolina? If so, please sign below to join my team today. We need your help today. Would you consider donating to ensure our campaign has the tools we need to win?